Polar Bright High Brightness EL Wire is perfect for Outdoor use. Priced right and made to last, Polar Bright EL Wire will make your projects come to life. Use with any inverter or sequencer for amazing lighting effects. This white is White when and glows�Pink-white when off. 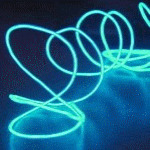 Polar Bright High Brightness EL Wire is perfect for Outdoor use.